Developers like to think of themselves as rational, methodical and driven by facts instead of beliefs. That gave rise to the popular myth of software field driven by meritocracy, instead of popularity/fashion/tribalism. This way we can feel better about ourselves and look down on fashion industry. Instead, we’ll jump on the next most popular (err. best) tool which came out from our popular designers (err. smartest developers) solving our world problems (err. first world problems). FlatBuffers is nice serialization protocol from Google. While idea is nothing new and people have been doing such stuff for a long time, it tries to go a step further and be cross platform compatible. In doing so several optimizations which work in some unmanaged languages, stop working in most managed ones. This gave rise to the myth of how to solve serialization problems in Java: “Just replace your JSON library with FlatBuffers”. Years before it was: “Just replace your JSON library with Protocol Buffers”. Even Facebook solves their performance problems on Android the same way. When someone actually digs into code and tries to understand/explain how such protocol works it sounds like a mad prophet. Google was kind enough to release public benchmarks along its library. Conveniently they only benchmarked the C++ implementation. What was not nice is the impression that other implementations behave the same. At least they did provide benchmarks, which is great improvement over the previous attitude that benchmarks are misleading and won’t tell you anything. That attitude crossed over with to CapnProto library, which shares the same underlying problems in managed languages as does FlatBuffers. 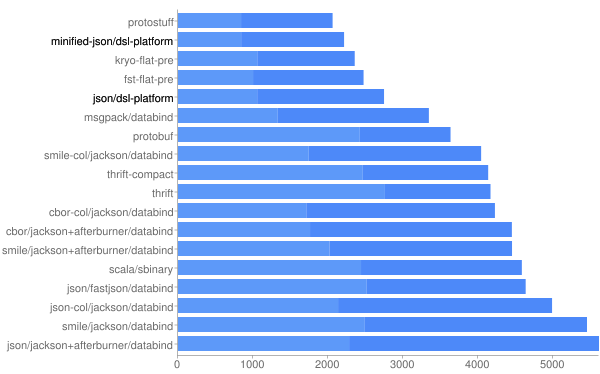 Most popular benchmark for JVM includes various other libraries. While it’s not perfect, it’s the go-to benchmark for Java. Unfortunately updates to the repository stalled, but it still provides excellent starting point for comparing various libraries. Latest run includes FlatBuffers and CapnProto. If you are expecting those two near the top, you will be surprised. Since CapnProto Java implementation is not official it gets a pass. FlatBuffers on the other hand is maintained by Google. Since they advertise FlatBuffers as cure for the cancer, you would expect it would do better when put to the test. There is a lot of room for improvements for Java FlatBuffers implementation. If Google wanted, they could improve the implementation (or hire someone outside), so they are at least not behind JSON. But when you are popular/big you can push your invalid point such as: “When serializing data from statically typed languages, however, JSON not only has the obvious drawback of runtime inefficiency, but also forces you to write more code to access data (counterintuitively) due to its dynamic-typing serialization system” and people will accept it without critical thinking. While “runtime inefficiencies” for converting objects into “string” exists, unless you your payload consists mostly of primitives and collections of primitives, those “inefficiencies” are minuscule. If we are sending whole object over the wire, it’s not really useful to read only parts of it. It’s much better to only send interesting parts anyway. While this might lead to more code, it’s only because people are used to reusing existing POJOs everywhere. FlatBuffers doesn’t allow nesting, which causes you to serialize everything as a flat sequence. This prevents it from being used in a streaming environment and solving actual problems developers have (such as streaming lists of objects). While schemas are nice and most apps would benefit from writing less POO and more models, schema for the sake of serialization only is missing the bigger picture. In Javaland there is one “standard” JSON framework/library – Jackson. It’s been around forever, has various features, great performance and abundance of documentation. As such it’s no wonder that it’s the default choice for any Java JSON problem. And when you have such reputation you are constantly compared with various alternatives in poorly constructed benchmarks, since that’s easy benchmarketing; which is understandable, since that’s the fast route to being famous and getting the girls… err, internet points. Even Jackson authors find benchmarketing tiresome to the point of building their own reference benchmark. So, in a world of benchmarketing noise, how do you actually differentiate yourself? Benchmarking is very hard to get right. People fall in all kind of traps. Correctly interpreting the results is often coordinately omitted. That’s why we should strive on improving community driven benchmarks, at least in the open source world. Microsoft Bond, Google Protobuf, FlatBuf and various other interface description languages are either liked by those which appreciate structure imposed by them for improved portability and performance or disliked by those satisfied with their true language. What’s common about them is they all end up serializing JSON, although at much lower speed than Jackson. DSL Platform wasn’t designed to be an IDL or to generate JSON serialization code. As such when DSL-JSON library for DSL Platform was built, it was not really interesting to ones who just wanted to serialize some JSON and not dabble with some unknown domain specific language. But performance was there and it was so good, that it was comparable with fastest JVM binary codecs. Fortunately there is go-to benchmark for JVM serialization where it could spark some interest. To stay sane, you ignore negative feedback and just continue on your lonesome path. Today DSL-JSON can be used in Java idiomatic way through annotations; in the background IDL will be written on the fly based on code metadata (meaning you don’t even know IDL exists). This way it doesn’t feel strange to those repelled by IDLs and is difficult to tell it apart from reflection based databinders. Every benchmark has it’s own set of issues, sometimes at the will of authors (so they can game the results), sometimes due to messy evolution. JVM serializers is no exception and is kind of shame it’s mostly dormant. One problem with that benchmark is that it creates a lot of garbage, which is not really something a benchmark should do. If it didn’t, then instead of DSL-JSON near the top it could be on the top instead. Maybe even Simple Binary Encoding wouldn’t have objections to it. The most popular benchmark on Github is Techempower benchmark (followed closely by JVM serializers). While Techempower benchmark has all kinds of it’s own issues, it is certainly valuable – up to a point in forcing Microsoft hand into improving their ASP.NET abysmal performance. Nobody likes to look bad on that benchmark and it’s funny when authors pull their framework if it’s not at the top of the charts. Anyway, thanks to that framework benchmark we can see how changing JSON serialization library can give 80% better performance at the top of the chart. If you look at round 12 JSON results of their benchmark, you could spot something very strange; servlet beating Netty and Undertow at throughput. Netty as Java performance poster child beaten by Servlet v2? That can’t be, must be some issue with configuration; is the default reasoning for those which even notice that numbers. Java Servlet beating C while in lower loads? Nobody notices that. And that’s not the worst part. The worst is when you talk to someone in person about that stuff; and at best it ends up with a tap on the back, but mostly ends up with “sure you did, buddy”. But you move on, ignore programming pop-culture, err… meritocracy; and take the next performance consultancy. March 12, 2015 by Rikard Pavelic. It's often said that abstractions slow down your program, since they add layers which makes your application slower. While this is generally correct, it's not always true. Performance can be improved somewhat by removing layers, but the best way to improve performance is to change algorithms. So let's see how we can beat performance of writing SQL and doing object materialization by hand, as it is (wrongly) common knowledge that this is the fastest way to talk to the database. which would return a tuple for each row in the table. is it faster or slower for Postgres to return the second version? can we parse the second response faster than the first response on the client side? Common pattern in DB access is reading two tables to reconstruct an object on the client side. While we could use several approaches, let's use the "standard one" which first reads from one table and then from a second one. This can sometimes lead to reading inconsistent data, unless we change the isolation level. To make things more interesting we'll also investigate how performance would compare if we used a type instead of table for the items property. In that case we don't need a join or two queries to reconstruct the whole object. While this is slightly more taxing on the database, if we did a more complicated search, it would be much easier to process stuff in order via the second version. The above query actually returns two columns, but it could be changed to return only one column. With each nesting layer more and more space would be spent on escaping. By developing optimized parsers for this specific Postgres TEXT response we can parse such a response very quickly. Verdict: manual coding of SQL and materialization has become non-trivial. Joins introduce noticeable performance difference. Manual approach is losing ground. Sometimes we have nesting two levels deep. Since Postgres has rich type support this is something which we can leverage. So, how would our object-oriented modeling approach look like if we had to store bank account data into a database? Our SQL queries and materialization code will look similar to before (although complexity will have increased drastically). Escaping issue is even worse than before and while reading transactions we are mostly skipping escaped chars. Not to mention that due to LOH issues we can’t just process a string, it must be done using TextReader. Although we have looked into simple reading scenarios here, insert/update performance is maybe even more interesting. Approach took by the Revenj and backing compiler is not something which can realistically be reproduced by manual coding. Postgres is suffering from parsing complex tuples – but with smart optimizations that can yield net win. There are also few "interesting" behaviors of Postgres which required various workarounds. It would be interesting to compare BINARY and TEXT protocol on deep nested aggregates. JSON might have similar performance to Postgres native format, but it's probably more taxing on Postgres. May 26, 2014 by Rikard Pavelic. This is part of WDIW series – where we reflect on our misuse of a specific technology, which results in all kind of weird edge cases. In the end we always ask ourselves, is all software just buggy or are we doing something wrong? Grammar for DSL Platform is currently defined in ANTLR, or better to say in unmanageable 7k+ lines of ANTLR. And it doesn’t include any other grammar like C#, Java or SQL, which it should. Of course we don’t actually work with 7k+ lines of code, but instead work with small snippets which are aggregated into that grammar behemoth. So you could say that we have a small working set of ANTLR grammar – 100 lines or so, for defining a DSL ANTLR grammar, in which we build snippets for each concept used in DSL and as a result get a fully defined grammar which we send to ANTLR. But, whether this will actually compile is up to the target languages (C# and Scala support this). where you can pick up Name from definition and identity from the [Key] attribute. By having a ModuleConcept property you’re implicitly extending its grammar. You can also use the interface to extend multiple concepts at once. By adding something other than text editor on top of it, you can get to work directly on the AST, just like MPS does. Of course, you also have external constraints such as how each rule ends, starts or is extended by. By moving away from that approach, we got a lot more flexibility in the grammar, which still looks very closely to the AST, but it’s not a 1-1 mapping anymore. Unfortunately, now we have to actually define grammar instead of being implicitly defined by the AST. One could argue that previous approach is superior extensibility-wise (and extensibility is very high on our priorities), since you can just plug in a new AST type and parser automatically picks it up (as long as there are no ambiguities created, or such similar issues). But in practice, you don’t change grammar that often and even when you do, you usually just add a new snippet which is included automatically into the aggregated grammar and pass it through ANTLR. I guess dynamic-ism at the grammar definition level didn’t pan out to be that important since all you need is a recompile. Often you can have a mix of both, so you can have dynamic-ism at few important places. For example in DSL Platform we can add new simple type (such as int/float/decimal) without grammar changes, as long as few rules are satisfied. This makes DSL easily extendable at important places. Funny how our newfound love for ANTLR turned out, since today we constantly have the need to remove ANTLR from our system, due to it not coping well with the grammar. We are using ANTLR3 with infinite lookahead (not that we need it, but otherwise ANTLR produces incorrect grammars), since we get all the benefits of grammar validation, ambiguity warnings and rather fast parser using pre-built DFA. During initial phases of grammar definitions we would end up with a lot of strange errors, for example ANTLR missing arguments to rule, since it moved execution of the rule somewhere else. But I guess, there are workarounds for that, since there is a couple of ways to use context arguments in rules. What we can’t workaround using vanilla ANTLR is its DFA explosion (at least without extensive code changes to ANTLR). Some rules create such a big DFA that on few rules it takes 60+ seconds just for processing that rule. But even that is not a big deal, since we don’t rebuild the grammar all the time, but rather that you can’t compile languages such as Java when ANTLR outputs target Java file. In Java there is a limit of 64KB for classes/methods which are broken with generated code. Some of it can be fixed, by moving variable initializations in class into other classes, but methods with giant switch statements and dozens of if statements cannot be fixed that easily. What’s worse, latest version of ANTLR3 doesn’t even manage to build our grammar. Strangely enough, latest .NET ANTLR3 port works fine. One can say, that again, WDIW, since almost always you will hear advices such as, don’t build context sensitive grammars since they don’t play well with existing tooling. But if you want to have something which can be easily read by both programmer and non-technical person, you don’t really have a choice. At one time we even considered moving to ANTLR4, since it seemed that it should cope better with such a grammar. Due to our abstract factory factory around ANTLR grammar, it wasn’t really hard to translate it to ANTLR4, but I guess we didn’t really like the dynamic nature of ANTLR4. Not getting ambiguity warnings anymore and not really using much of ANTLR features, it didn’t really make sense. So considering that we don’t use ANTLR for anything else besides parsing to our token representation in a single pass, it seems like a technical debt to use ANTLR at all. ANTLR4 prefers that you use hooks instead of injecting code snippets, since code snippets can’t be translated easily to other languages (except when you know how to translate it to other languages and have an abstract abstract factory which enables you to do just that). I guess ANTLR4 was trying to solve some other problems and it doesn’t fit our requirements nicely. What’s worse when you look more deeply into its relationship with other parsers/communities, you will find out that parser writers almost always suggest writing your own parser to take full control of the process. So it looks to me like ANTLR gave up on trying to serve their needs. So, we’ll be staying with an older version of the previous ANTLR, at least until we decide it’s time to drastically improve IDE support. May 10, 2014 by Domagoj Smoljanović. Querying tables over database link is very common today. But what happens when we have a table that depends on one or more user defined types? Oracle needs to know the structure of our table and it’s columns when it receives it over the DB link. However, it cannot retrieve that information from remote server (although it would be nice to have this in future) and that’s why it raises an error: ORA-22804: remote operations not permitted on object tables or user-defined type columns. Types need to have exact OID as ones on the remote server. Types don’t need to have member functions implemented as on the remote server. You can either omit them completely if you don’t use or need them. Or you can implement them in your custom way if you want. Here is an rough example of how it works. We’ll start on remote server and create needed objects (type and table). -- We are going to need OID from remote server later, so let's get it right away. -- REMOTE SERVER PART CREATE OR REPLACE TYPE ContactInfo AS OBJECT ( phoneNumber varchar2(50), address varchar2(500), mail varchar2(100) ); CREATE TABLE users ( id NUMBER(10) NOT NULL, username varchar2(20), contact ContactInfo ); -- insert one record: INSERT INTO users VALUES (1,'uuser',ContactInfo('+385123456789','Somewhere, Atlantis 21314', 'uuser@atlantis.com')); COMMIT; -- We are going to need OID from remote server later, so let's get it right away. SELECT type_name, type_oid FROM dba_types where type_name='CONTACTINFO'; TYPE_NAME TYPE_OID -------------------- ------------------------------------- CONTACTINFO 582FAF525C684D7DB094F959FC667063 . Now we’ll switch to our server. Let’s assume database link REMOTEDB is already created and goes straight to our remote user. REF, nested TABLE OR VARRAY. October 7, 2013 by Rikard Pavelic. Relationship types are a great way to express dependencies and their relationships. In Autofac there is a bunch of implicit relationship types. Still, there are some issues since some of relationships require types which don’t exists in BCL such as Owned<> and IIndex<,>. But a great one which cuts down on boilerplate is the Func<> relationship. To set up Autofac we register services into the container. This all works nice, but what should happen if we registered our service as instance per context/singleton? How should container behave now? Currently Autofac will return the same instance and ouch, our dispose method will be called multiple times. To make it more obvious that this is the wrong behavior, we can use factory with parameters and add disposed check. It’s obvious now that it’s wrong to reuse previous instance, since it will have different Args field value (and will write to console wrong value) and worse it will throw ObjectDisposedException. When we try to resolve SomeOtherService we’ll get an exception saying that MyInstanceFactory is not registered. Why is that? which will allow new instances for MyInstanceService. It looks kind of strange that we are unable to resolve instance type which we registered, but when you consider the relationship type, it becomes clearer why it behaves like that. So, in the end Autofac will behave the same way with this “correct” registration, but the “fixed” version will not support same instance resolution from factory, but rather throw resolution errors. July 31, 2013 by Rikard Pavelic. While Postgres’s type system is second to none, Postgres still lacks some features here and there. Stored procedures with their own transaction management are high on that list. But, beside transaction management, SP usually come with a cool feature which can cut down chatting with the database server to the minimum. with which you can collect the whole Invoice aggregate at once. Postgres has a better way of solving this particular example, but what about when you want to select two unrelated aggregates in a single query. For example, if your web page has a dozen of queries, you can combine them in a single SP and fetch all data with a single call to the database. Since this works in Hot Standby mode, an explicit transaction is not really an issue. What are the alternatives in doing this kind of query and how far can we take it? Since Postgres supports arrays we can just shove results in array columns and have a more OOP-like result. Let’s take it a step further and see if we can remove some of the boilerplate? Maintaining this function becomes cumbersome if sorted_top_items view needs to be modified. Postgres dependency tracking will complain that load_page_types depends on sorted_top_items and needs to be dropped to alter the view. While this is a good thing, if you don’t have a setup which will automate object rebuilds, it’s very annoying to do it by hand. All of this is nice, but what to do when we don’t want to use server side functions? June 21, 2013 by Robert Petranović. Unfortunately, PHP does not come with built-in way to control a console or a terminal. Many PHP CLI applications suffer from this as they often require users to enter sensitive data which should not be visible as they type it. The most obvious example is entering a password – imagine doing a presentation and having to type your password so that everyone can see it. This guide will show you various ways to hide input from console, discussing strengths and weaknesses of each. This method is really simple and easy. Unfortunately, it does not work on Windows. You’ll see that string “red” is actually colored red! The escape sequences start with the ESCAPE char (octal 33, hex 1b, ASCII) followed by a a ‘[‘. This 2 char sequence is known as CSI (Control Sequence Introducer) and it tells terminal that a command is coming that it should execute. The last char of a sequence is ‘m‘ meaning it will change the way text is being displayed based on numbers between the CSI and ‘m‘. You can provide multiple numeric commands separated with semicolon. Commands from 30 to 37 change the foreground color, while commands from 40 to 47 change the background color. Command 0 resets the display mode back to default. The full list of sequences can be found here. This is also the way popular library ncurses works and the reason why it doesn’t work on Windows. The interesting fact is that it used to work in MS DOS and Windows 95, but unfortunately Microsoft dropped support for it. I believe the best solution for Windows is to write a Win32 C program. If you already have headache because I mentioned C, don’t worry – the program is really simple. The reason I choose C is because by using Win32 API, the program will work on every Windows from 95 to 8 and on both x86 and x86_64 architectures without requiring any dependencies. Also it will be very small and it will Just Work. Surely you can do the same in Java, Python or C# but in that case users must have them installed. This code is a modification from this GIT source code. The reason I used it instead of writing my own (which would have much less lines of code) is that this is extremely well tested on almost every possible Windows version. You can even compile it from Linux for Windows. Just use mingw-gcc instead of gcc. Notice that this .exe file has only 24K. The only scenario where this won’t work is on Windows 8 for ARM architecture. But how many users will compile PHP on their mobile Windows 8 and use command line in it? My personal recommendation is to combine the C program if the platform is Windows and use stty method otherwise. That way your program will Just Work in almost any scenario. I’ll now discuss some other methods I found on the Internet that I don’t agree with. I strongly recommend against this. Another problem is that you can’t load a dynamic library built for different architectures, and loading the same library in different OSs or different versions of OSs can fail. PHP on Windows is almost always build for i586 and Windows’ APIs have good backward compatibility so no problem there, but on other OSs you’ll be lucky if it works. Also there might be incompatibilities with different PHP versions so even if you compiled for the right architecture, extension loading might fail because user has different PHP version. It might be a possibility for Windows, but it’s harder to write and more prone to errors. 10 years ago this would be the perfect Windows-only solution. However, this no longer works in Windows 7 and newer. It’s not enabled by default and even if it is, it works only on some Windows OSs. You can only change the color of the whole Console and you can’t change foreground and background to the same color. So your only option to mask a password is to make your console extremely ugly. May 24, 2013 by Marko Elezović. The first thing that springs to mind when thinking about method polymorphism is the use case of having an identically named method accepting different argument types. So, what is return type polymorphism (return type overloading)? A keen observer would rightfully comment that this does not compile, not with vanilla Scala 2.10.x at least. Let’s give it a prod. Jasmin is an assembler – a very low level programming language for the JVM. It’s about as low as you could comfortably get unless you want to write class files with a hex editor. All right – now we have a separate class file containing the overloaded methods. And there you have it – although it’s impossible to compile such a class directly from Scala, once it’s compiled and added to the classpath it is very easy to invoke it. smaller and more confusing by having a dozen different methods all named a(). There are a couple other examples I could list, but this kind of an approach is losing value recently as Scala macros are stepping out of their experimental phase and are becoming more relevant. May 23, 2013 by Rikard Pavelic. Impedance mismatch problem is a widely known one, with many tools trying to solve it the wrong way. It’s so famous with so many failed attempts, that it got recognized as the Vietnam war of Computere Science. Before ORM tools became popular, applications were usually built by first modeling the database, and then creating queries and mapping those queries to objects. Multiple queries per object was immediately recognized as a problem without an adequate solution. While this widely recognized problem was correct for some databases, more advanced could work around this problem. Even today, these workarounds are not mainstream knowledge and the multiple queries problem is often used as an excuse for SQL alternatives. As ORM tools matured developers started building applications by modeling objects and modeling database to match those objects. Further improvements to ORM tooling also allowed creation of database tables and sometimes even simple migrations. Unfortunately, ORM tools promised database independence; this resulted in features that could only be implemented in all databases and could not cover non-trivial scenarios. At the same time, more advanced databases (such as Postgres) which focused on features instead of popularity were not fully utilized and looked bad on trivial benchmarks. ORM tools created all kind of problems by trying to map objects to databases in this way, but lets not reiterate those problems here. So what went wrong and how to actually solve the Impedance mismatch problem? To cross the chasm, objects must be modeled in the database too. The problem is that this is not available in databases such as MSSQL or MySQL. This makes it a no go for most ORM tools, since they want to support all databases. Guess what’s the VALUE(optional) if the left join fails to find a match? Well, in Oracle it’s an instance of object source2 with all fields null. We can use a workaround with CASE WHEN to work around this issue, but unfortunately it’s not the only one. Fortunately Postgres behaves as expected and doesn’t suffer from this particular issue. Probably the biggest problem is the schema evolution. Since object oriented features are not very popular, managing objects has all kind of issues. Changing type is not a simple ALTER TYPE operation. Dependency issues are probably the most annoying ones. When you start using objects in a table column you can’t just change them as easily as before. If managing objects in the database is such a pain, is it really worth it? Well, it’s worth as much as you want to minimize the mismatch. Applications are not about classes or tables, they are about models. Domain model is the most important thing in an application. Relations and classes are just a representation of that model in used technology. So, how to solve this problem? By moving up the ladder of abstraction. The same way as we started to use C instead of assembly, we should start abstracting the model and going down the ladder of abstraction only when necessary. If database and classes can be created from some model this solves all kind of issues. NoSQL argues about improved developer productivity since they can reason about their model more easily and have less code to maintain. This, while hard, is a solvable problem – but it can’t be solved in a mainstream way. Mainstream ORMs which offer similar features do it through templates. Classes generated from the model should never, ever, be modified by hand. Unfortunately, nontrivial applications can’t be easily expressed in a template. What about databases, since ORMs are known for horrible SQL queries? The problem with horrible SQL queries is a programmer/framework one. A bad SQL query is usually result of a missing feature. Extendable frameworks you to solve this easily, just plug-in this use case until the root cause has been fixed. While it’s not widely known that any object can be mapped to a row in a table and NoSQL solutions are exactly about that, this is usually not the best approach to every mapping. Sometimes a single object should be mapped to a single row, but most of the time it should span several tables and this distinction depends entirely on the model. The solution is to use SQL databases which support this feature. This is not an actual technical issue and since the model should be shared across all “departments” it should reflect both developers and DBAs viewpoints. Also, this is actually a framework/tooling problem. If inadequate tooling is creating problems for some department, sometime they will take measures as drastic as entirely forbidding tooling. Solution to this is to stop using bad tooling. If some framework doesn’t support even the most basic database features such as bulk operations, stop using it. Moving up an abstraction this is not a problem anymore. Both database and classes are representation of a single model. Freezing the model in code or database is a result of inadequate abstraction. If renaming a field is risky because it may break something it’s obvious that there is something wrong with the development process. Concurrency is hard, deal with it. The best way to deal with it is to rely on databases for transactions. MVCC doesn’t suffer from many problems found in non-MVCC databases. Cache invalidation is one of the hardest computer science problems. LISTEN/NOTIFY and Advanced Queuing goes a long way to help with cache invalidation. Again, this is an inadequate database and/or a bad framework problem. Oracle and Postgres support collections of objects. This allows them to provide complex aggregates in a single query. LINQ drastically simplifies interaction with the database from code. Type safety and code familiarity are powerful tools. Manual SQL is always an option, but the main goal is mapping to objects. Languages which do not support LINQ can, in best case, fall back to method chaining but that leaves a lot to be desired. Domain-Driven Design provides an excellent modeling tool. Understanding the model provides insight about interactions with objects. When cache understands the model all kind of issues are mitigated. The problem is that for cache to be able to understand the model, either the developer has to specify a lot of information or there must be a higher abstraction which understands the model and know when to invalidate the cache. E.g. When views are expressed in a model they are there for a business reason. Unfortunately, views are rarely used in ORM tooling since they are really complicated to manage. Object-relational databases offer ways to bridge the Impedance mismatch problem. But they alone are not enough. Domain-Driven Design provides language for better modeling. But it alone is not enough. Combination of a DSL for describing the domain model using DDD concepts and compilers which can maintain application components is a viable solution to solving the Impedance mismatch problem.